We have physiotherapy (moist heat, ultrasound therapy, electrical stimulation, traction) as well as massage therapy provided by licensed massage therapists. His deep understanding and intense interest of the human anatomy has allowed him to have tremendous success with disc-related injuries and pinched nerves. 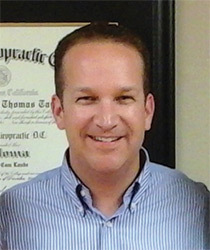 Dr. Taylor provides welcome relief from stress, headaches, and pain using specific chiropractic adjustments. Dr. Taylor is also trained in low force techniques. Click on the pdf icon and download this convenient new patient form. You can complete the form in Adobe Acrobat. Or you can print it out and write in the information. Once finished bring the form with you to your first appointment. "4 Ways to Get Moving & Get Healthy"
Dr. Taylor provides chiropractic services to the Camarillo, Oxnard, and Ventura areas. Also serving the Conejo Valley including Thousand Oaks, Newbury Park, Westlake Village, Agoura Hills, and Moorpark. Copyright © 2019 Tyler T.Taylor Chiro.